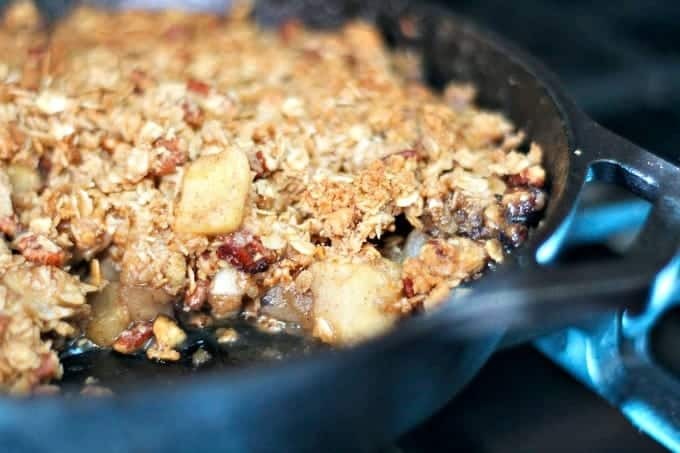 Skillet Apple Crisp – diced apples, brown sugar, cinnamon, a vanilla bean cooked together in some butter on top of the stove in a cast iron skillet. 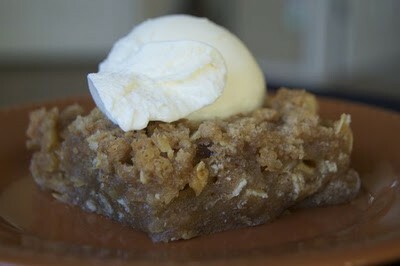 It is then covered with a streusel topping made of oats, cinnamon, nutmeg, brown sugar, pecans and butter. This is a dessert you will be asked to make again and again! 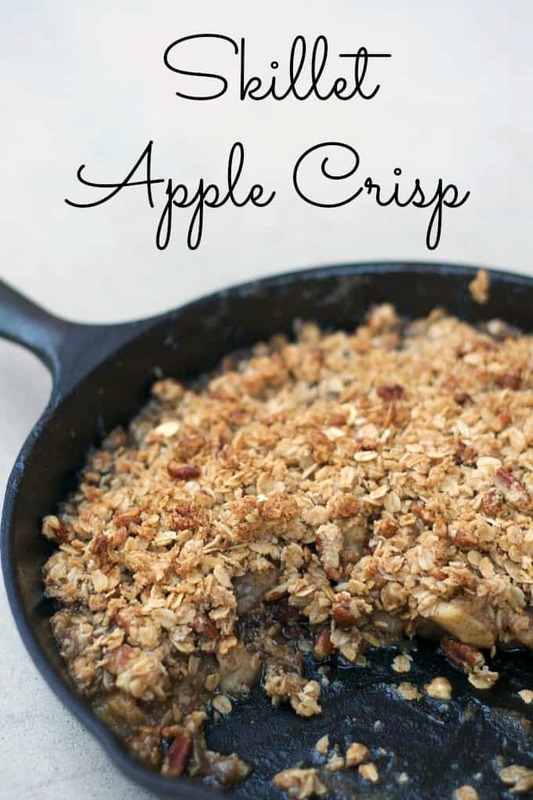 Oh, how I have a thing for an really good apple crisp. I guess you could say that I’ve actually always had a thing for apple crisp. It really has been one of my weaknesses. And top it with a scoop of vanilla ice cream? This one I was eating it right out of the pan because it didn’t even need anything else on top! Fortunately, there’s plenty left over only because there were just two of us here to taste it, so I think for my next helping I’ll do just that – add a scoop of vanilla. I have to say that it was pretty darn good to get into the kitchen today. I’ve been semi-laid up with a bum rear molar. Oh, the pain!!!! For the past month or so it’s been somewhat sensitive to temperature and last weekend I thought I had an earache, so didn’t really pay too much attention. I’d had SO many of them as a kid, eventually having the old adenoids removed, that just thought it was yet another nuisance and would go away. Tuesday morning it was more centralized to the tooth and by Wednesday, I was ready to pull it myself. I would fer sure pass out if I did that and the thought just sends shivers up me spine. Went to see a dentist and made the dreaded appointment for a root canal with crown for next Thursday. Until then she gave me antibiotics for the infection and Oxycodone for the pain. As of yesterday, I scrapped the Oxy because I can’t stand the way that stuff makes me feel – dizzy, really detached and just. plain. Out of it. I’ll just stick to my Excedrin, thank you very much. And no, this is not a paid endorsement, nor did I receive free Excedrin, antibiotics or Oxycodone. Fortunately, and I say VERY FORTUNATELY, a CONSIDERABLE amount of the pain has subsided believe it or not, since the antibiotics have kicked in. I actually don’t even need too much in the way of pain management and it’s been MUCH easier for me to sleep. I’ve also been pretty miserable to live with, if I do say so myself, but the hubby and son have been pretty cool and sympathetic. Our oldest daughter even pitched in the other day. She lives an hour and a half away and she and I were texting Thursday afternoon. Seriously? I really didn’t think she’d agree to it so readily, but she did have the next two days off work and didn’t have anything going on, so without saying anything to her father and brother, she showed up. It was cool and I like people taking care of me. I think I should agree to it more often. So should you. Even if you’re not sick or feeling under the weather. I adapted this recipe from this one at Buns In My Oven. 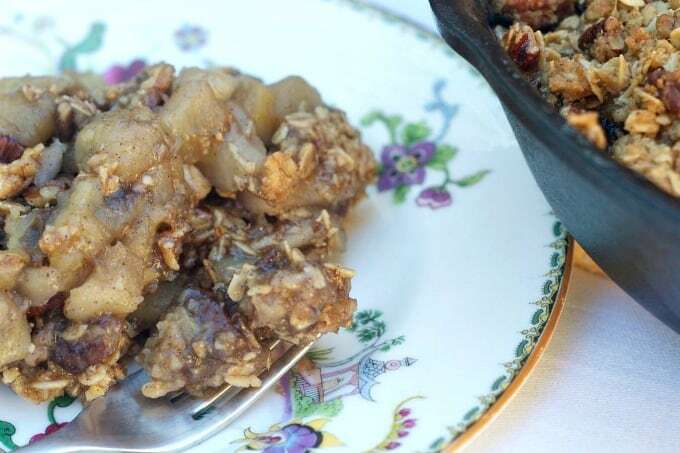 Diced apples, brown sugar, cinnamon, a vanilla bean cooked together in some butter on top of the stove in a cast iron skillet. It is then covered with a streusel topping made of oats, cinnamon, nutmeg, brown sugar, pecans and butter. This is a dessert you will be asked to make again and again! 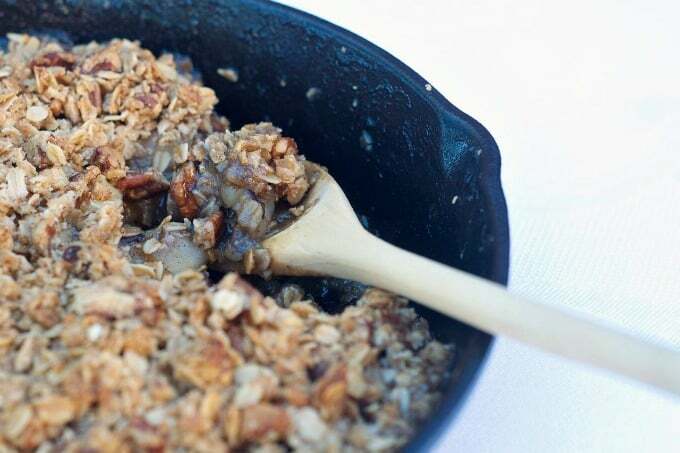 In a medium bowl, mix together the oats, pecans, flour, brown sugar, cinnamon, nutmeg and salt. Cut the 6 tablespoons of butter into small pieces and using your fingers, massage the butter into the mixture until it is incorporated fully. 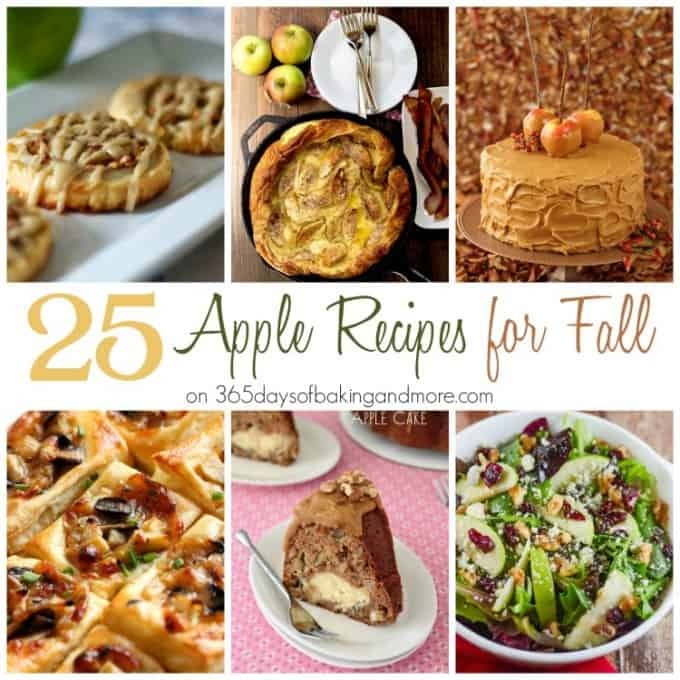 In a large bowl, toss the apples with the tablespoon of lemon juice, brown sugar, cinnamon and salt. Over medium heat, melt the 3 tablespoons of butter in a 10-inch cast iron or oven-proof skillet. Using a sharp knife and on a cutting board, slice down the middle of the vanilla bean. Gently scrape all of the vanilla bean goodness (those little egg-looking vanilla bean specks) out. Add the vanilla specks to the melted butter and stir for about a minute. Increase heat for the skillet up to medium-high and add the coated apples. Cook for 5 minutes, tossing the apples gently in the vanilla butter. 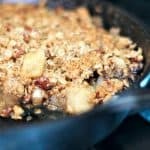 Remove from heat and evenly scatter the streusel topping over the apples. I rate everything I make on a scale of 1 -4 with 4 being the best and this Skillet Apple Crisp earned 4 rolling pins. It. Was. Just. That. Good. I don’t know if I’ll ever fix it any other way. I am absolutely IN LOVE with my brandy new cast iron skillet and am inspired to use it for EVERYTHING!! ok, maybe not everything, but a lot of things. Buy one. You won’t be sorry. I’m ALL for cast-iron skillets, not for Oxy. 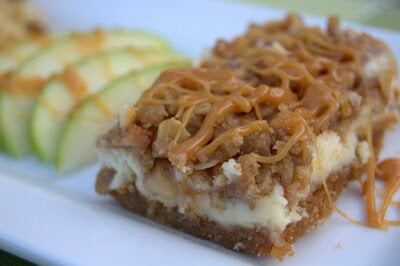 Angela for this recipe I used Honeycrisp apples. 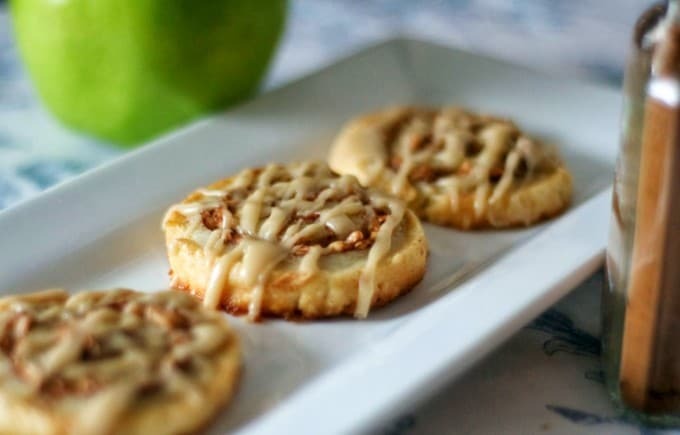 They have a really good texture and won’t become mushy when baked as say MacIntosh apples do. This is one of those desserts I don’t think of making. This looks delicious!